From one point of view, the first-round match-up between good friends Stan Wawrinka and Benoit Paire looked heavily weighted in the Swiss man’s favour. Wawrinka was the one with three Major titles, the one with a Masters title, the former champion in Rotterdam, back in 2015, the one who had risen to No3 in the ranks and reached the semis of the World Tour Finals three times, the one with 16 career titles from 28 finals. His opponent had won his only title from five finals back in 2015, had briefly broken the top 20 more than three years ago, had got beyond the third round of a Masters only once, in Rome in 2013, and had made the fourth round of a Major just twice in 32 attempts. Yet looking at the match-up from a different angle, it was Paire who currently had the edge in the rankings 58 to 68, had won three matches this season—just as Wawrinka had done—and had won two of their last four matches, all four of which had gone to a deciding set. It promised, then, to be a close-fought affair. Wawrinka was still far from his Major-winning best after his slow return from double knee surgery 18 months ago, admitting before the tournament that he needed more matches, and more wins, to build up his confidence. He lost in the first round in Rotterdam last year and lost his opener in Sofia last week. Paire’s recent seasons had also been blighted by niggling injuries, and his record in Rotterdam was not encouraging: He had managed just one main-draw win in four visits. But he was a man of prodigious talent when the stars aligned, with a big serve but also touch, variety, and creativity. Which Paire, then, would face Wawrinka? Initially, it was the very tricky Paire, who does not give any rhythm to his opponent, fires down unreturnable serves, throws awkward drop shots. There was little in it in the early goings, but Wawrinka blinked in the seventh game, and Paire pounced, breaking to 15. A quick hold, and Wawrinka was up against it, and he threw down his racket in disgust. Indeed, he faced set point in the ninth game, but edged the hold, and turned the tables with some ultra-aggressive returns, converting the second break point when Paire dropped a ball into the net. It went to a tie-break, and Wawrinka kept his momentum and some admirable focus, especially when Paire went down 4-2 and then 6-2, and smashed his racket to smithereens. It earned the Frenchman a warning but no reprieve. Wawrinka got the set, 7-6(4). Now Paire was chuntering to himself and to whoever else would listen, as a growing number of errors piled up, some dropped into the net, some sliced out. He ambled about the baseline like a lost soul. Again, Wawrinka focused, took control, ventured to the net, and broke in the third game. Indeed, it would become one-way traffic, with another break for 4-1. 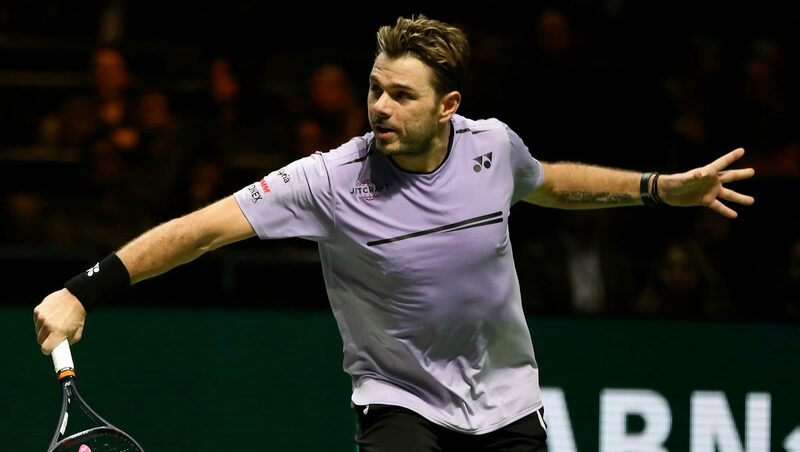 There was a flurry of excitement in the sixth game as Wawrinka faced a couple of deuces, but he dropped the hammer to break again, 6-1, after one final Paire drop-shot landed short and soft, 6-1. “I think my knee is good. Physically I’m happy where I am on the court, the way I am moving on the court, the way I can push on it, practise on it. At the Australian Open I played four hours and I was still moving really good, so I think I’m confident with that. It was a swift couple of minutes in press: He clearly had a dinner date. And he would be able to enjoy a day off, too, while his next opponent, either Philipp Kohlschreiber or Milos Raonic, contested their place in the second round. In the other half of the draw, fellow 30-something Andreas Seppi beat Peter Gojowczyk in three sets and Mikhail Kukushkin beat Dutch hope Robin Haase.